With my job, I'm very lucky to be sent the latest beauty products to try and because of this, I tend to chop and change regularly as I test out the most recent product to arrive on my doorstep. It's rare that I use a second bottle or tub of product as once I've finished it, something new comes along. There's a few of exceptions to this rule, such as my favourite perfume, my beloved La Biosthetique shampoo, Benefit Badgal Mascara or Elemis' Monoi Moisture Melt but in general, it's fair to say I'm fickle in my product usage. With this in mind, it's arguably all the more impressive that I'm now enjoying my second bottle of Basil, Mint and Black Pepper Body Wash from Shiffa Dubai. It may sound like something which belongs in your kitchen not your bathroom but don't let that put you off Shiffa Basil, Mint and Black Pepper Body Wash. I'm currently loving the energising shower gel for use on sluggish autumnal mornings when frankly, all I want to do is hit snooze and roll over. With a predominant hit of mint, the Body Wash smells absolutely incredible and genuinely offers effective energising properties, more so than any other shower gel I've tried. It's certainly bringing some of that famous Dubai sunshine into my morning routine. 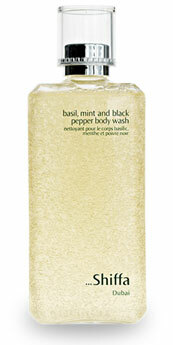 The texture of the body wash is quite jelly-like and a little goes a long way. It's a natural shower gel without SLS so there's no real lather to speak of but I like that it leaves my skin feeling conditioned. The presentation is suitably luxurious- a sleek, slimline bottle presented in a ribboned box. When I first tried Basil, Mint and Black Pepper Body Wash, I didn't really like that you had to pour the product out of the bottle to dispense it so I'm pleased that they've listened to feedback and my second bottle has a handy pump offering much more control. At over £20 for 200ml, it's not cheap but is justified in that it's more affordable than my Starbucks habit.